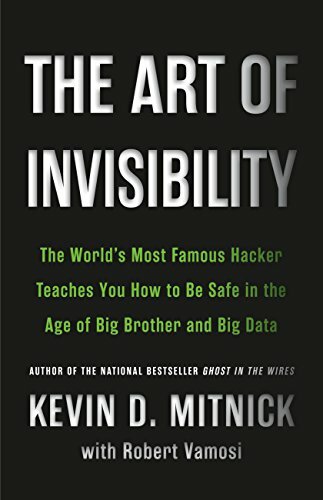 The Art of Invisibility: The World’s Most Famous Hacker Teaches You How to Be Safe in the Age of Big Brother and Big Data by Kevin Mitnick with Robert Vamosi. I’ve been thinking a lot about information security and privacy lately, so much so, that I deleted my Facebook account. I deleted it, not disactivated it. It took work, but I downloaded the entire contents of my profile and waited about 60 days before it was completely gone. My disgust had already been growing with FB and I deleted it just before the Cambridge Analytica scandal. If I hadn’t done it when I did, I would have done so after that scandal. That’s all fine and dandy, but I knew my online life was full of gaping holes, and I wanted to start to tighten it up, with the advice from this book. I’m not trying to become invisible, cover my tracks, or otherwise set myself up to be able to commit possibly nefarious crimes. I would like to take a greater degree of control over the security variables that I can control. The book takes a look at the varying levels you can tighten up parts of security in your digital life. Different browsers are discussed and analyzed for their degree of security and privacy and recommendations made about closing security gaps. Computers are reviewed and what physical and digital things you can do to minimize how much data your computer collects and transmits about you. A section on mobile devices covers both phones and tablets focuses more on apps, api’s, network selection, than which devices are more secure. A good reminder is to set your own screen lock and disable fingerprint recognition. Using Facebook or Google to sign in across services is scrutinized in depth. Related to apps, terms of service (TOS) are investigated to show what companies collect, store and possibly monetize (probably) so understanding what the finer points of a TOS agreement really means. When I read the section on routers, I knew this had to be first on my list to correct. There are so many eye opening revelations about our routers, and simple fixes, that if you do one thing, follow the steps in the router section. There are many suggestions which might be overkill for most people, like using TOR as a browser, but others seem like overkill, though they are not, signing up for a personal VPN service. I’m thinking $6 a month is really not that bad. Then you can feel very secure in logging into unknown, and untrusted, public wifi networks, because your communications are encrypted end to end. An alternative to using public wifi, is to use your phone data plan, or turn your phone into a mobile hotspot. This seems reasonable, except that if you do that, you’ll use more data, and even on Project Fi, arguably the cheapest plan for users of less than 4G a month of data, an extra 1G of data is $10 a month, so that’s actually more than the cost of a personal VPN. If getting a personal VPN is technically daunting, it shouldn’t be but I understand if it is, then go the extra data route, though it might cost more. There were MANY suggestions that are simple fixes, technically or behaviorally, offered in the many different categories in the book. Depending on the level of privacy you desire, you can implement a few or many, and you will help protect yourself, your network and devices, your identity, and possibly your activism. My recommendation would be to have a checklist at the end of each chapter, in order of priority, for things to check and/or fix. That would set the readers up for success in that small byte sized (see what I did there) steps could be taken to secure your digital world. This summer, I’ll take one chapter at a time, implement some of the fixes I employ, and document it here in the blog. Perhaps checklists will arise from that work.